Where and when can I buy fresh chestnuts in Australia? 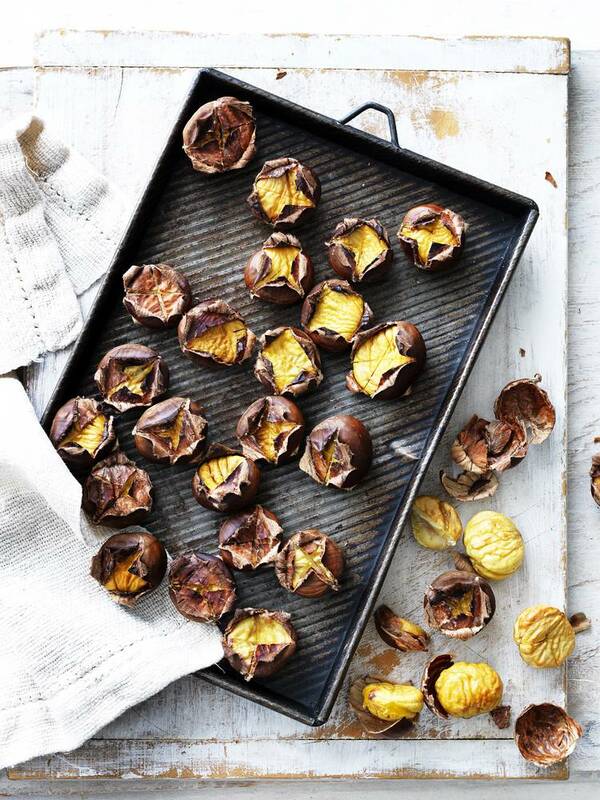 The Australian season for fresh chestnuts begins early March and runs through to July. Fresh product is available through the major supermarkets, and your local green grocer (if they don’t stock chestnuts, just ask them to get some in for you), and direct at the farm gate from some growers . Are Australian chestnuts available in December in Australia? If you are looking to purchase Chestnuts for the holiday season you are able to purchase Australian Chestnut products; flour, puree, frozen peeled (uncooked – these are ready to use), peeled vacuum packed (cooked – these are ready to use) online. How do you roast chestnuts? Score chestnuts by cutting a small x on the flat side with the tip of a sharp knife. Place on a tray in a hot oven or under a moderate to hot grill for 10 – 15 minutes depending on size. Parts will burn and go black, don’t worry, this is just the outer shell. When ready place nuts in a clean tea towel, wrap them for up to 5 minutes. Unwrap and peel both the outer shell and inner skin (pellicle) off. Enjoy! What is the difference between varieties? Most people are not aware that there are different varieties of chestnuts. It’s probably best to think of them like potatoes. Some varieties are better for mashing, some for roasting, some for potato salad. Most growers in the Australian industry now sell by variety, so once you get to know the varieties you can decide which one suits your needs and tastes. There are several different Chestnut varieties to choose from that suit a list of applications. See below the different varieties and their uses. What is the difference between Chestnuts and Horse Chestnuts? Where can I purchase Australian Chestnut flour? You can purchase Australian Chestnut flour from the following websites online at www.cheznuts.com.au contact the producer direct to see what other value added chestnut products they sell and for outlets. How can I dry chestnuts? Cut the nuts in half (a cleaver works well) and place them, cut side down on the drier trays. Set the heat to medium and allow nuts to dry for 8 to 10 hours. At this stage the shell will almost slip off and the pellicle (the firmly attached brown skin which encases the actual nut) can also be removed fairly easily. Alternatively you can place the cooled nuts in a well-sealed container (or firmly closed plastic bag) and remove the skin later (family entertainment on a cold wintry evening!). Store nuts in the pantry until needed. They will keep for up to 12 months. When using peeled nuts, they will need first to be re-hydrated. Simply cover them with boiling water and leave overnight (for up to 12 hours). Drain off liquid and then use nuts as you would fresh ones. Remember that the nuts are still raw at this stage and will need to be cooked for the same length of time as fresh nuts. Boiling chestnuts is a simple method. Place in hot water for 15 to 20 minutes after which they can be pureed, sieved or chopped. Can you freeze chestnuts? How? Yes, Chestnuts can be frozen, two ways. To freeze chestnuts so that they can be enjoyed all year round, leave the shells intact and pack them into a sturdy plastic bag or container. Frozen nuts once thawed are not suitable for roasting but are perfect in soups, purees and seasonings. You can also roast chestnuts, peel and then freeze for use in stuffing’s, soups and cakes and to snack on.